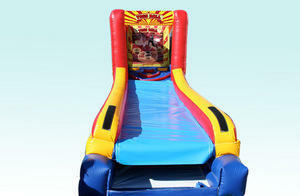 This exciting Skee Ball game has been an arcade favorite for years and is now offered in a portable inflatable model. Features a manual Velcro scoring system and automatic ball return. Comes complete with 4 soft balls.